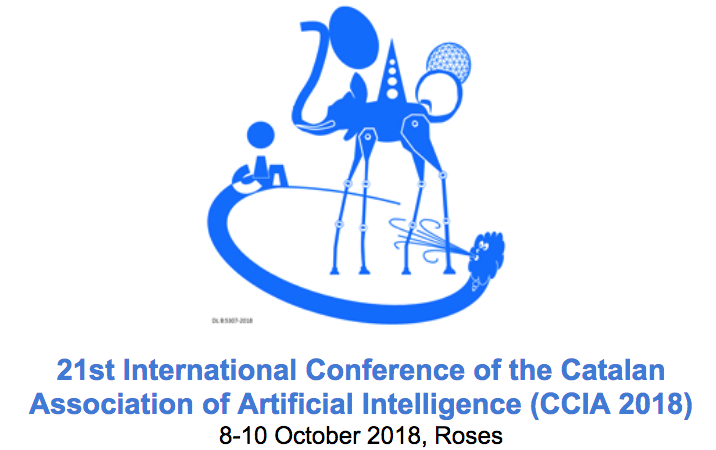 IRIS had the pleasure of being one of the sponsors of the 21st International Conference of the Catalan Association for Artificial Intelligence, (CCIA 2018) which took place from October 8-10th at Roses, in an incomparable frame of the Mediterranean. The purpose of this conference was promoting discussion around the last advances in Artificial Intelligence and encouraging to create great professional relationships focused on opening the path to industries to its use, with original and innovative ideas. Some of the topics discussed were the real impacts, opportunities, risks and technological challenges of Big Data; the benefits and the added value of using AI in the industry and the expectations about its ethical use. IRIS, with the special presence of Alejandro Rosales and Iván Paquico, participated in a roundtable about the ‘Transferring of AI to real companies’, discussing the current penetration of Artificial Intelligence in the industrial sector. We hope our contribution will be added to the rest of the great innovator’s ones.